The Sopac TA 2002 Thermostat enables you to automatically switch on or off your electrical devices of your growing room according to the indoor temperature. Made of top quality materials. 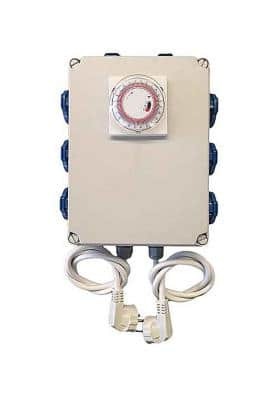 The Sopac TA 2002 thermostat enables you to automatically switch on or off your electrical instrumens of your growing room according with the temperature of the growing areac. The majority of the thermostats are developed to precisely turn on or off electrical devices according with the temperature in a certain enclosed area. Indeed, Sopac TA 2002 thermostat can be connected to the specific electrical instruments of the Marijuana crop being an ideal ally to control the temperature and ventilation of the growing room. To use it, you just have to set a specific temperature and the thermostat will automatically turn on or off the ventilation system in case the room temperature increase or decrease the previously defined temperature. This thermostat has a scalable button control ranging between 6 C (minimum) and 30 °C (maximum) with readings of 1 °C between 15-25 °C, allowing to define the required temperature with your finger. It is made of top quality materials and is resistant to several defined temperatures. To place it, we recommend you to use a flat space without waste paint or plaster being in full contact with the room cultivation environment and without any interferences. choose a flat area that has no waste paint or plaster and that is in full contact with the room air culture, without interferences. It is strongly not advisable to place it behind a door or from direct sunlight or hot air released from the ventilator as these will lead to incorrect readings. Considering that the output contacts have no protection, you must provide it yourself.